The following table presents the map reference points and main chronological periods represented at sites with entries in Vols. 1–5. 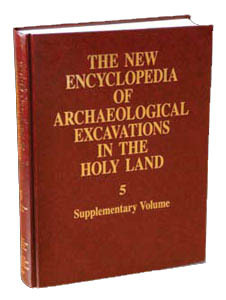 Sites in Jordan appear separately at the bottom of the table, without reference points. The map reference points are given in varying degrees of exactitude. Abbreviations used on the table are as follows: OIG LA—Old Israel grid, latitude; OIG LO—Old Israel grid, longitude; NIG LA—New Israel grid, latitude; NIG LO—New Israel grid, longitude; PA—Paleolithic periods; NE—Neolithic period; CH—Chalcolithic period; EB—Early Bronze Age; MB—Middle Bronze Age; LB—Late Bronze Age; IR—Iron Age; PE—Persian period; HL—Hellenistic period; RO—Roman period; BY—Byzantine period; EI—Early Islamic period; CR—Crusader and Ayyubid periods; LI—Late Islamic period; OT—Ottoman period. For time ranges of the various periods, see chronological tables on pp. 2126–2130.